Every year outstanding personalities recognize the work of EYA Winners and congratulate them on their efforts and engagement! Read their messages to the Winning teams! 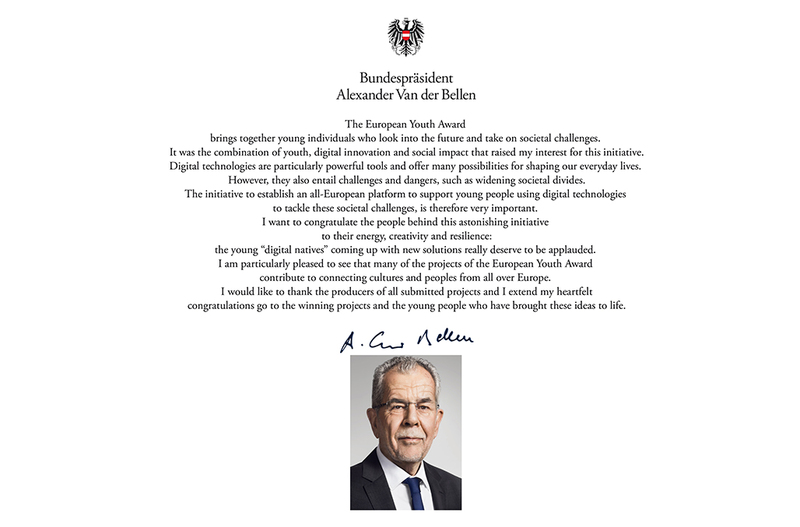 My congratulations go to this year’s winners and nominees for the European Youth Award. Yet again, this competition has attracted many innovative projects from young people across Europe. This year’s high-quality entries prove that today’s digital tools can be put to good use safeguarding democracy and human rights. I am very pleased to see that so many of the winning projects address issues that relate to the core values the Council of Europe promotes and defends on a daily basis, including education, diversity, active citizenship, democratic participation and, of course, human rights. The scope of digital tools for reaching out to Europe’s citizens is wide and the winners of this year’s awards show that they can be used in ethical and meaningful ways, bringing down barriers and promoting social cohesion. No doubt, in the years to come, European Youth Award winners will be looking more and more at using artificial intelligence (AI) in their projects. After all, this is an element that will exert greater influence in our lives. We should welcome the benefits of AI and its potential to help human beings maximise their time, freedom and happiness. privacy and security, and ensure respect and protection for human rights online. Young people’s creativity, critical thinking and active participation will be key to making that happen. Congratulations once again to the winners! The European Commission’s representation in Austria is partner to the European Youth Award (EYA) festival in Graz. We appreciate the pan- European spirit of young entrepreneurs working on digital projects which will make the EU and society a better place. Their work combines business opportunities with social objectives. As sometimes financing is an issue of concern for innovative firms and start-ups the investment plan #investEU and other EU programmes could offer chances. So far, the EU Fund for Strategic Investments (EFSI) has triggered € 344 bn in investments. Even more opportunities will be offered by the EU budget 2021-2027, which we have proposed and is currently under discussions with the EU member states. It will strengthen the EU’s policy focus even more on innovation, digitalisation and social investment offering smart initiatives for young business people with social responsibility. There will be also more “Social Europe” making sure that the economy serves the society and not the other “way around”. explain how the European Commission supports digital innovation, growth and jobs in Europe. Once again, this year’s European Youth Award rewards and draws attention to the many young people who are eager to use digital tools to provide innovative solutions to current economic, social, and environmental challenges. Young people are playing a leading role in shaping today’s digital revolution. Thanks to their original ideas, entrepreneurial skills and energy, they are having a positive impact on society. The European Commission is working to support you. In December 2016, we launched the ‘Digital Skills and Jobs Coalition’ – as part of the Skills Agenda – to support cooperation among education, employment and industry stakeholders and give a voice to young people’s ideas. More recently, the European Pillar of Social Rights – our framework to support fair and well-functioning labour markets and welfare systems in the face of rapidly changing societies – puts innovative forms of work, entrepreneurship and self-employment at the top of our agenda. Today more than ever, Europe needs young people who are able to generate creative ideas and who have the entrepreneurial mind-set to turn those ideas into action. Congratulations to the winners of the European Youth Award 2018! I would like to congratulate all participants in this year’s European Youth Award – a wonderful event where the creative and innovative ideas of young people take centre stage. Looking at the winning projects, I am delighted to see how young people use new technologies to find effective solutions to the challenges facing our society. Young people are the most active users of new technologies. Their ideas and projects are crucial for the progress and prosperity we want to see in Europe. Digital competences are key in this. That is why I put forward an Action Plan on Digital Education in January of this year. It sets out how we can help ensure that young people become confident, active users of digital technologies, rather than just passive consumers. This involves helping schools go digital, supporting teachers and encouraging more girls to take up IT-related subjects. The European Youth Awards show just what young people can do with new technologies, and how they can help us build a resilient, cohesive society for the future. Congratulations again to everyone! Using a mobile app to borrow the eyes of sighted volunteers enables blind people. That was the first idea from EYA that I learned years ago when I got to know the European Youth Award. This is what practically describes how “digital solutions in the field of social entrepreneurship” can be understood. I am still fascinated how a technical solution, which is no longer incredibly difficult to implement, serves a social purpose. Innovation is building an understanding of a need and the creative process of creating a satisfaction of that need. The European Youth Award makes Austria and Europe richer in empathy and translates into business and society. The youth are our future, that is why it was my special pleasure to welcome the onsite jury of the European Youth Award 2018 in Prishtina. The European Youth Award connects young and ambitious people from all over Europe who understand digital technologies as a powerful tool to tackle societal challenges. Support and advise from peers and from experienced business managers, in combination with a creative and inviting working atmosphere at all of EYA’s events is what makes this initiative so attractive and valuable. I hope to see all the Winning Projects flourish and become European-wide solutions that actually improve lives. I am looking forward to joining the Festival in Graz, meeting these inspiring young people and congratulating in person! For seven years in a row, the European Youth Award has empowered young people to take up the challenges of digitalization and deal with new technologies and innovations. The EYA creates a community of young change-makers and future leaders that will help to shape and improve our society. It is particularly pleasant to see a pan-European contest thriving and connecting young people all over Europe through such vibrant and pressing issues. I am personally convinced that such initiatives will help to educate people about the importance of maintaining a leadership position in these fields and help strengthen the ties of the European Youth. I therefore want to congratulate the winners of the European Youth Award 2018 and thank them for their valuable contribution to our societies. Their efforts and creativity help us to improve our lives for the better. Digitization has become an integral part of our working and living environment. Young people are at the forefront of digitization in many ways, as they have grown up with new media, internet, apps and digital games. But they are also exposed to special risks. As a youth minister, it is important for me to inform young people, sensitize them and strengthen their media literacy. A high media literacy, but also creativity and sensitivity to the challenges of young people and the requirements of today have been proven by the winners of the European Youth Award. This year too, this award recognizes digital projects that are valuable to society and implement the goals of the Council of Europe and the EU’s Europe 2020 strategy. I thank the whole team and congratulate the winners very much. The Federal Ministry of Finance has been supporting the European Youth Award (EYA) for a while now. The EYA is not just a contest. With its main idea to improve society through digital creativity it is the epitome of modern times. me with pride that the Federal Ministry of Finance gets to support an organization like this. has to react to new technologies and challenges! possible in order to be ready for the future! We want and must push technology advances in Europe in order to ensure prosperity within the European Union! The young generation has to face future challenges like sustainability, health, education, employment, social cohesion, cultural diversity and climate change. Digitalisation is high on the political aganda. Therefore the EYA competition is an incentive and an unique opportunity for young people to deal with these new challenges and present ideas for improvement of our lifes by using social media and digital technologies. It is a pleasure to acknowledge that a category „Planet Friendly“ was created and that many of the projects belonging to other categories refer to the Sustainable Development Goals. I want to congratulate the winners and I wish them and the people involved in the organization of EYA all the best for the future.